Only one tourer chose to join me doing day tours along the eastern Sierra. My originally scheduled, joint SMS activity was to ski Mt. Goddard, which at one time had almost twenty people signed up. One by one, they dropped out. The weather forecasts may have shared the blame, but I think most persons didn't really wish to spend multiple nights out in the bitter cold and wind. It may have been a bit too early for good enough spring snow, too. I met my friend Pat and we both drove south on U.S. 395 to the vicinity of Bishop. Our first day ski tour took us to the overflow parking for North Lake trailhead. This is on the paved Lake Sabrina Road. We hiked up the dirt North Lake road, which, for Pat, was hard in his rigid, plastic touring boots. We put on skis at about the regular North Lake trailhead, and had to fight some impediment by aspen trees to get to our goal. There seemed no easy way around or through them. But then we were in the clear, and skied approximately along the route of the trail to the long, lakes basin, and then up to Piute Pass (11,400'). It was very windy, and we had encountered some guides with two female companions. They said they were going to do a multi-day tour. We never saw them again. I was glad we weren't doing our Goddard ascent. It was just too miserable. I shot a photo of Mt. Humphreys (13,986') to the north. The snow wasn't real good skiing back down from the Pass. At least it was gentle terrain. I had fun telemarking on the one steeper section, and took pictures of Pat. He is proficient at doing regular parallel turns with his better ski gear. We fought through the aspen thickets again, then hiked back down most of the road. Driving back to Bishop, we used Brown's Town Campground as our base camp. I enjoy warmer temperatures plus dinner in a restaurant, or at least cooking with tables and something to sit on. 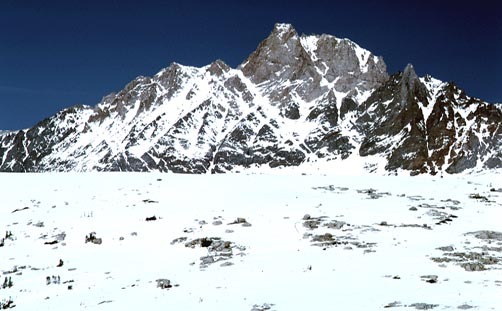 The next day, we hoped to ski to Lamarck Col. It was still windy, and route-finding was a problem. We reached about 11,600 feet elevation when the snow became just too icy. I wasn't able to turn easily, and neither could Pat. I shot a few pictures, and we managed to ski back to North Lake, and then hike to the cars again. Again, we camped in Bishop. The third day, we tried Rock Creek Canyon. The paved road was gated and closed, two miles down from where the road was covered with snow. Walking on pavement is hard on feet in heavy touring boots. We came to the Rock Creek Lodge where we were offered coffee and breakfast. I had a small coffee, and we were told that conditions had already reached their peak. Continuing on, we had lousy snow, and then tried to climb up the southeast slopes of the canyon to reach some goal. It was terrible. We headed back to the car where Pat had enough. A choice expletive well conveyed his feeling about this whole trip. The wind and cold were just getting us down a little too much. I had enough, too, and after Pat left, I drove home. This was one of my worst leads, and I felt badly for all concerned.